William Grubb, cellist, made his professional debut as soloist with the Indianapolis Symphony Orchestra at the age of 17. 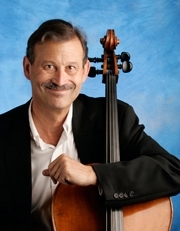 He holds three degrees from the Juilliard School and was only the fourth cellist in the school’s history to earn the Doctor of Musical Arts degree. While at Juilliard, he was winner of the Concert Artists Guild competition and presented his New York debut recital at Carnegie Hall. His cello teachers have included his father, Cassel Grubb, Fritz Magg at Indiana University, Ronald Leonard at the Eastman School of Music, and Harvey Shapiro at Juilliard. Grubb holds teaching positions at Butler University, Jordan College of Fine Arts and the University of Cincinnati, College-Conservatory of Music. Summer positions have included the Aspen Music Festival and School where he served on the board of trustees for nine years and the Great Wall International Music Academy in Beijing. For twelve years he toured with the piano trio, Aspen Soloists, presenting concerts in 49 of the 50 states as well as Europe, and South America. In chamber music performances he has shared the stage with artists including the American String Quartet, the Angeles String Quartet, Isaac Stern, Michael Tree, and Dawn Upshaw. He is married to Laurie Carney, violinist in the American String Quartet and lives in New York and Indianapolis. He plays cellos made by Antonio Gagliano, 1832, Giulio Cesare Gigli, 1770, and Than Kim, 1995.